Windows is not able to detect the disk space as well. I tried several other recovery apps, but had no luck. In this post we address the problem shown below. If your system is showing a similar screen then this post is for you. If not, you have a different problem and should NOT follow these instructions. 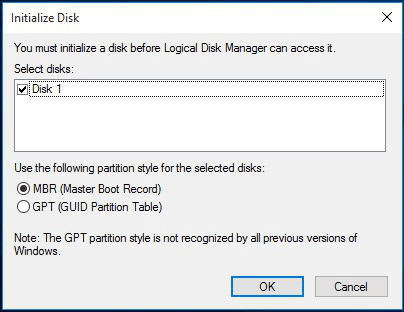 The Unknown Disk / Not Initialised problem can sometimes occur without warning on Windows based systems. It’s often caused by an incorrect shutdown or incorrect external hard drive removal from the system. This isn’t always the cause though, sometimes there can be a more serious problem specific to the hard disk that causes this error. The good news is that the data still remains on the hard drive, but unfortuanately you don’t have any way of accessing the Unknown / Not Initialised disk. Don’t reinstall the hard drive and start loading your software all over again. Anything you add to the disk at this point has a very good chance of overwriting the data that you want to recover. The cause of the problem dictates the actions necessary to retrieve the data. The first thing to determine is whether the problem is a simple data corruption (caused by the incorrect shutdown / removal mentioned above), or something else like a hardware problem on the hard drive. 2. Hook the hard drive up to this PC using an external disk caddy or adaptor. 3. Re-initialise the drive. Nothing else. 4. Run some data recovery software on the reinitialised hard drive. If the cause of the problem was a data/file corruption, your files should be discovered. 5. If this doesn’t work then you’ve a more serious problem. Remove the hard drive from the system and contact us for advice. You can find your nearest Data Clinic location here.